City Cabs are proud to support many local charities. It’s great to be able to put something back into the community through sponsorship or through raising awareness. Supporting charities is a major part of our ethical and corporate social responsibilities policy. Capital Theatres is Scotland’s largest independent theatre charity which runs three city-centre venues; the Festival Theatre, the King’s Theatre and the Studio. Alongside the day-to-day operation of our theatres, we work with communities who experience barriers to accessing theatre, whether that be for financial, cultural, social or health reasons, and find ways for them to take part and enjoy theatre and the arts. From relaxed performances to dementia friendly performances and activities, to free tickets for children in care and panto visits to the Sick Kids, we aim to ensure that everyone gets the chance to develop a lifelong love of theatre. 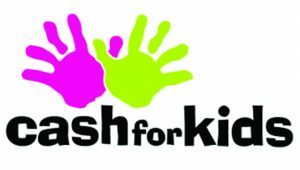 Cash for Kids is the official charity of Forth One, they’ve been helping children in Edinburgh, The Lothians and Fife for over 30 years. Cash for Kids helps children who are disadvantaged through poverty and who are sick or disabled. They also help groups and organisations that work to improve the lives of children in our community. They’re always looking for individuals and organisations to get involved. Maggie’s is there for everyone and anyone affected by cancer, offering a programme of support that has been shown to strengthen physical and emotional well-being. 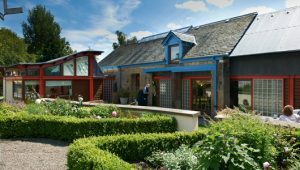 Built alongside the hospital, Maggie’s Centres are places with professional staff on hand to offer the support people need. They are places to find practical advice about benefits and eating well; places where qualified experts provide emotional support; friendly places to meet other people; calming spaces simply to sit quietly with a cup of tea. Maggie’s Centres are unique, welcoming and uplifting places and no other charity offers what Maggie’s does. “For me, Maggie’s represented a community, a place which was extraordinarily welcoming and where I could just crash out. You didn’t have to put up a front, but could just be. I still call by to catch up with friends I made there, which says it all.” Mike Charkow, Maggie’s Edinburgh. Walk the Walk came into being 16 years ago when 13 women Power Walked the New York City Marathon in their bras to raise money and awareness for breast cancer. What started out as a one-off fundraising event has blossomed into a thriving multi-million pound charity, raising to date in excess of £83 million for vital breast cancer causes. The charity was founded by Nina Barough who at that time ran her own production company. Nina woke one morning with what seemed like a ‘fun’ idea to Power Walk the New York City Marathon in decorated bras to raise money for a good cause. What makes the beginning of this story so magical is that Nina at that time had no experience of fundraising or taking part in a marathon nor did she know anyone who had been affected by breast cancer. Walkers in The MoonWalk Scotland have raised over £17.2 million since the first event in 2006, with most of the money staying in Scotland to help improve the lives of people with cancer. Kindred (formerly known as Special Needs Information Point, or SNIP) provides advocacy and information on services available to children with additional support needs and their carers. We also can help with completing grant and benefits applications, or can simply provide a listening ear. Based at the Sick Children’s Hospital in Edinburgh we work with the family of any child receiving treatment at the hospital. We can also work with families of children in Fife, and the Lothians. You can find out more about what we do here www.kindred-scotland.org. We welcome enquiries from parents, carers, professionals and anyone else with an interest in additional support needs. We do not charge you for information, and we will call you back if you contact us by phone. Our Helpline is open Monday to Friday 10 am to 4 pm on 0131 536 0583 (You can also call the Fife office directly on 01383 420 504). You can also get in touch with us by emailing kindred.enquiries@gmail.com or if you are in the Fife area at the new Fife base email at kindred.fife@gmail.com. We have been using City Cabs for several years now and find that we are listened to when any issues come up to make the use of taxis by families of children or young people with additional needs more enjoyable – we would like to thank them for that and their on-going support of Kindred.